Hello everyone ! 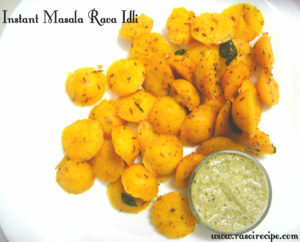 Today’s recipe is ‘Instant Rava Idli’. This recipe is easy and quick to enjoy idli. Authentic south indian idli needs time as it needs fermented batter. It is a popular breakfast dish. Idli is a very healthy dish as it is cooked through steaming process. In this recipe wheat rava (semolina) is used instead of rice rava. 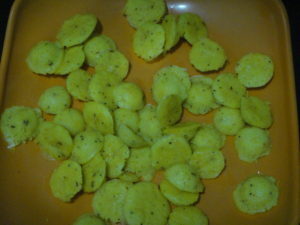 To cook instant rava idli, you will need semolina/rava/sooji as your main ingredient. Idli is often served with sambhar or chutney. Rava idli is a speciality of Karnataka. 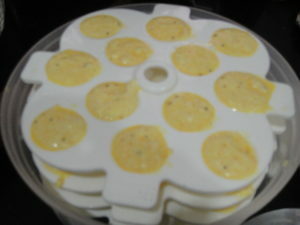 Instead of using a steamer, I used microwave for preparing instant idli. 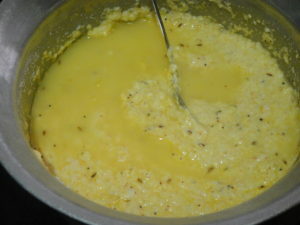 Mix semolina and butter milk in a bowl. Keep it aside for at least 10 minutes. Add chopped onion and green chilli in the mix. 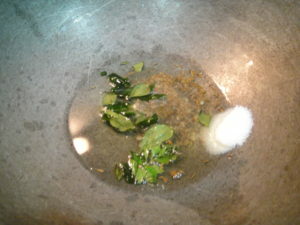 For tempering 1: Heat oil in a small deep pan. 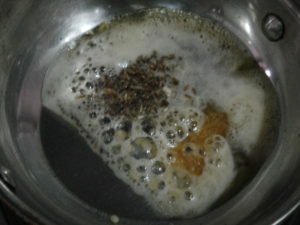 Add jeera and mustard seeds, let them crackle. 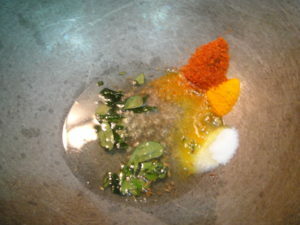 Add all the remaining ingredients of tempering 1 in the oil. 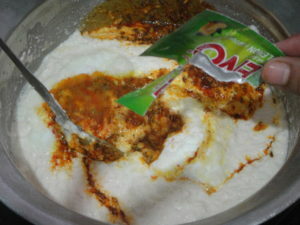 Temper the above idli mix. Mix well. At this stage, add fruit salt and mix everything uniformly. Tempering 2: Heat oil in a deep pan. 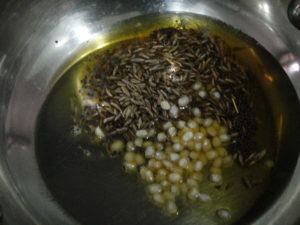 Add jeera and mustard seeds, let them crackle. 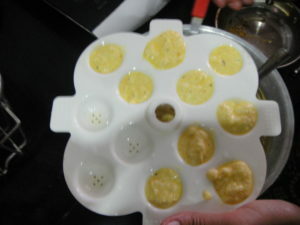 Add all the remaining ingredients of tempering, immediately add idlis in the tempering. 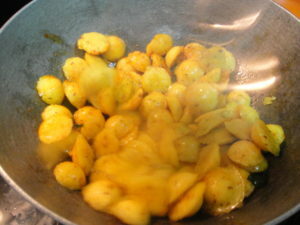 Cook till tempering coats all the idlis uniformly and are crispy. Your Instant masala rava idli is ready to serve ! Grind all the ingredients of chutney in a grinder in a smooth paste. For tempering: Heat oil in a pan. Add all the ingredients of tempering and cook for a minute. Temper coconut chutney and serve it with masala idli. 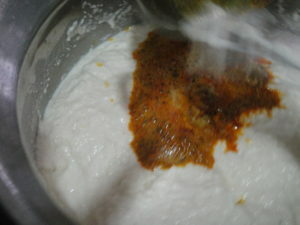 If the idli batter looks very thick in consistency then add little amount of water. 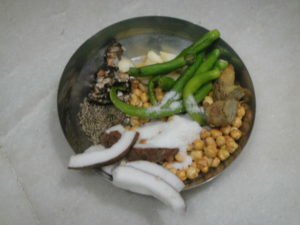 You can also add dry fruits in the idli. I have made instant idli some time back, almost forgot how I did, thank you for sharing it! The mini idlis you made look so cute and I’m sure it tastes so good too? It was very tasty. This chutney is highly recommended by me. This is my mom’s recipe and trust me it tastes yumm. ? Actually this is a lengthy explanation of dish, otherwise it’s easy to prepare. ☺ Do let me know their feedback on this recipe. Thank you dear. I love coconut chutney too. ? Great dish… I’ll definitely try this. 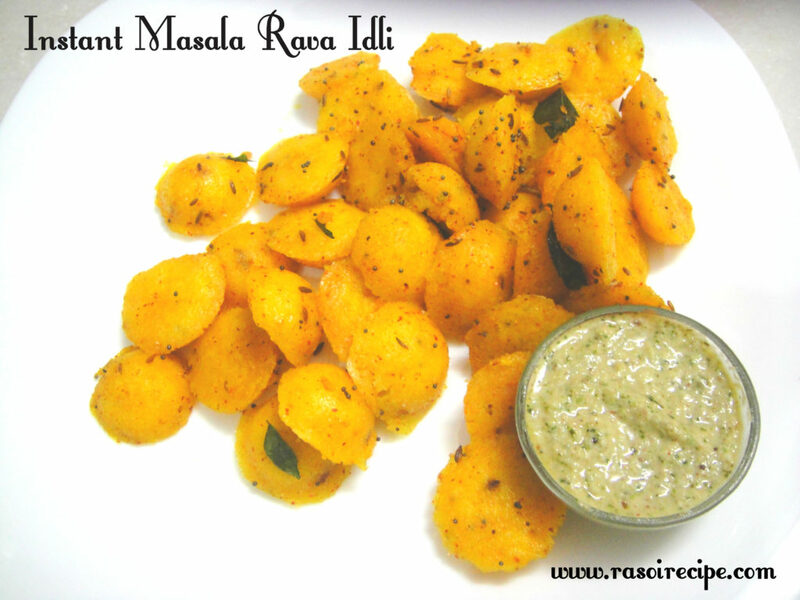 I’ve never tried masala rava idli. It sounds so yummy.